From the dazzling Michael Kors Access Sofie to the more subdued and masculine Armani Connected smartwatch, Fossil’s 2018 lineup offers something for everyone. Some say wearables are doomed: after all, the growth of this consumer electronics category has plateaued since its birth, and multiple manufacturers have already exited the market due to underwhelming demand. Smartwatches, especially in their early days, lacked standalone capabilities and the power to replace traditional watches. With Android Wear 2.0, however, which Google took a long time polishing, the search giant is hoping to spark renewed interest in the smartwatch category, and it looks like Fossil Group will be a vital part of that effort. The Diesel On Full Guard is a full touchscreen smartwatch. It boasts a 1.4-inch circular screen with 454 x 454 resolution as well as a massive 370 mAh battery. As you may have guessed, it’s powered by Snapdragon 2100 and 512 MB of RAM. Pre-orders are set to go live on August 29 with the entire collection expected to be available globally on September 25 for US$325. 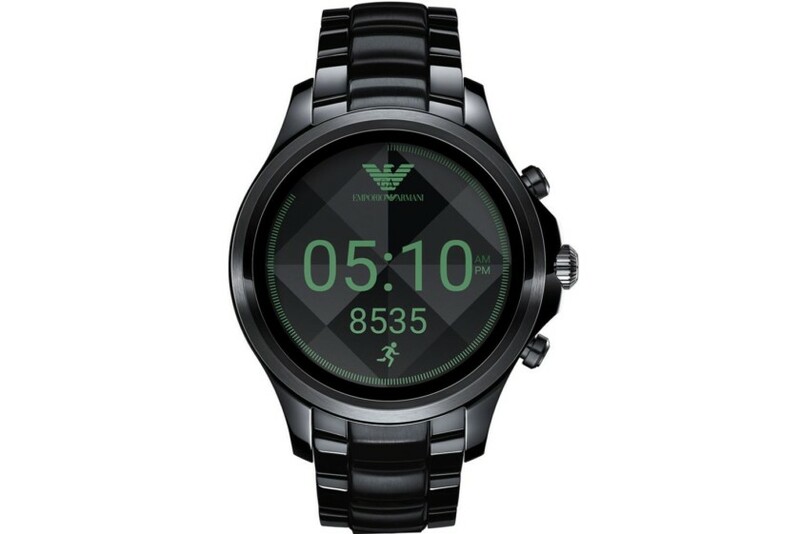 The first Emporio Armani Connected touchscreen smartwatch, which was first announced back in June, will be available on September 14 with 11 interchangeable straps, their materials ranging from leather and silicone to stainless steel. Details are scarce, but expect this Snapdragon 2100-powered device to cost around $300. The Fossil Q Venture and Fossil Q Explorist are the company’s first-ever full-round touchscreen smartwatches, featuring “stunning OLED displays and exclusive new watch apps.” They should be available for purchase right now for $255 to $275 in select Fossil stores and from the company’s online store. According to the company, the MK Access Sofie is designed for women with its “dazzling, sleek casebody and screen” whereas the MK Access Grayson is designed for men with its stainless steel casebody and oversized screen. Both of these were announced all the way back in March, and they will finally go on sale starting September 25. Pricing is unknown for now. The Misfit Vapor, which was unveiled during CES 2017, includes heartrate monitoring, 1.39-inch OLED display, Snapdragon Wear 2100, unique touch-enabled bezel, and 5 ATM water-resistance. As we previously reported, the Vapor will launch in October for $199. Fossil adds that hybrid watches from Armani Exchange, Chaps, Emporio Armani, Diesel, DKNY, Fossil, kate spade new york, Marc Jacobs, Michael Kors, MICHELE, Misfit, Relic, Skagen and Tory Burch will also hit the market later this year. While this may be old news for some, Fossil’s partnerships with fashion brands and Google showcase its continuing effort to expand its smartwatch portfolio. For electronics companies, the wearable sector may not be a worthwhile effort, but for traditional watchmakers, it’s a slightly different story: most of them have decades of expertise and the necessary resources, so adding a touch of modern technology isn’t such a big burden. Most watchmakers have decades of expertise and the necessary resources, so adding a touch of modern technology isn’t such a big burden. Android Wear 2.0 is still struggling to take off, but with fashion brands and conventional watchmakers jumping on the bandwagon, the market landscape might change in the near future. What kind of features do you look for in a smartwatch? Do you think price is the biggest drawback for most wearable devices? Let us know your thoughts in the comments below!